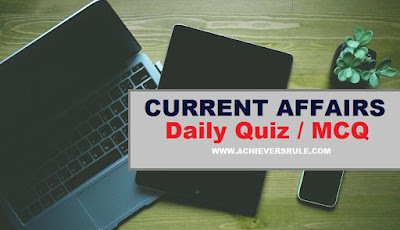 Solve the Daily Current Affairs Quiz - 12th January 2018 question set as it provides you all important questions that may come in upcoming competitive exams like IBPS, SSC, Railway. You must read thoroughly the Current Affairs one-liners - 12th January 2018 before solving the questions. Q1.12th January is celebrated as the National Youth Day in India on the birthday of ______ . Q2.Which of the following statements are/is true regarding the recent launch of PSLV by ISRO ? A]It was the 42nd PSLV. B]It was done through the "Multiple Burn Technology". C]The satellite was launched from the First launch Pad of Satish Dhawan Space Center in Sriharikota. D]PSLV stands for Polar Satellite Launch Vehicle. Q3.What is the rank of India in the list of Domestic Air Passenger Traffic Demand according to the Global Aviation Body, International Air Transport Association (IATA) ? Q4._____ and Dynamics Inc. have introduced the first battery-powered Interactive Payment Card at 2018 Consumer Electronics Show (CES) . Q5.The ___ Bilateral Technical Meeting on Cooperation in the field of Traditional Systems of Medicine between India and ____ . Q6.UN Environment and WHO have agreed to major collaboration on the Environmental Health Risks in ____ . Q7.Who is appointed as the Chairman of Maritime Board ? Q8.Baldev Raj has passed away recently. He was the Director of ____ . Q9.Name the shipyard that has signed a MoU with Mumbai Port Trust for Management and Operation of the Shiprepair facilities . Q10.Assam Chief Minister Sarvananda Sonowal has launched the World Bank Finance Project APART. It stands for ____ . Q11.Which of the following railways has introduced a new Fogpass Technology for Auto-warning train drivers during Foggy season ? Q12.Name the state which has launched a Water ATM project to provide bacteria-free drinking water in schools . Explanation 1. National Youth Day (Yuva Diwas or Swami Vivekananda Birthday) is celebrated with the great joy and enthusiasm in India every year on 12th of January. Explanation 2. ISRO's Polar Satellite Launch Vehicle PSLV-C38 successfully launched the 712 kg Cartosat-2 Series Satellite along with 30 co-passenger satellites from Satish Dhawan Space Centre SHAR, Sriharikota. This is the thirty ninth consecutively successful mission of PSLV. It was done through the "Multiple Burn Technology". Explanation 3. Emerging as a stand-out performer, India witnessed the highest growth of 23.3 per cent in domestic air travel demand worldwide in 2016 twice that of neighbouring China, according to IATA. India has topped in the list of Domestic Air Passenger Traffic Demand according to the Global Aviation Body, International Air Transport Association (IATA). Explanation 4. IndusInd Bank and Dynamics Inc. at the 2018 Consumer Electronics Show (“CES”) announced plans to introduce the first battery-powered, interactive payment cards to the Indian market in 2018. Explanation 5. The 5th Bilateral Technical Meeting on cooperation in the field of Traditional Systems of Medicine between Govt. of India and Malaysia was held at New Delhi which was a part of agreement signed between both countries in 2010. Explanation 6. UN Environment and WHO have agreed a new, wide-ranging collaboration to accelerate action to curb environmental health risks that cause an estimated 12.6 million deaths a year in Nairobi, Kenya. Explanation 7. V J Mathew was appointed Maritime Board Chairman. The decision in this regard was taken by the Kerala cabinet. Explanation 8. One of India's most renowned nuclear scientists, Prof Baldev Raj, Director, National Institute of Advanced Studies (NIAS), passed away while attending a conference in Pune. Explanation 9. SShares of Cochin Shipyard rose 6.5 percent as it has signed MoU with Mumbai Port Trust (MbPT). The company signed a MoU with Mumbai Port Trust (MbPT) for management and operation of the shiprepair facilities at Mumbai Port Trust. Explanation 10. Assam Chief Minister Sarvananda Sonowal has launched the World Bank Finance Project APART. It stands for Assam Agribusiness Rural Transformation Project. Explanation 11. The Northeast Frontier Railway (NFR) has introduced a new GPS-based system in all locomotives for auto warning to train drivers during the foggy season. The system is also expected to ensure timely running of trains. Explanation 12. West Bengal Panchayat and Rural Development and Public Health Engineering minister Subrata Mukherjee today said the state government has launched a water ATM project to provide bacteria-free drinking water in schools.